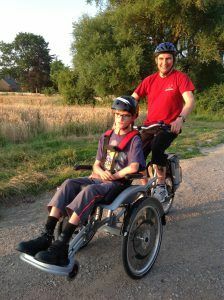 Elifar has part-funded a specialist wheelchair bike for 14-year-old Max who has severe learning, communication and physical disabilities. The bike which comes with an electric motor to help with hills, allows Max to exercise outdoors and take part in family activities. Elifar helped to buy the £7,360 bike, contributing £3,860 to top up funds raised by the family from a variety of supporters.